The Gospel of Luke is a synoptic Gospel, and the third and longest of the four canonical Gospels of the New Testament. The text narrates the life of Jesus, with particular interest concerning his birth, ministry, death, and resurrection. It ends with an account of the ascension. The author is characteristically concerned with social ethics, the poor, women, and other oppressed groups. Certain popular stories on these themes, such as the prodigal son and the good Samaritan, are found only in this gospel. This gospel also has a special emphasis on prayer, the activity of the Holy Spirit, and joyfulness. D. Guthrie stated, “it is full of superb stories and leaves the reader with a deep impression of the personality and teachings of Jesus." The text is internally anonymous. One of the two oldest surviving manuscripts P75 (circa 200), has the attribution According to Luke. The other which 'is probably to be dated earlier than P75 ...has no such (surviving) attribution. Tradition holds that the text was written by Luke the companion of Paul (named in Colossians 4:14) but scholars are divided on this issue. Most scholars accept the two-source hypothesis, that the text is based in part on the Gospel of Mark and a now lost document, and place the composition of Luke between 80 and 90. A few scholars postulate an earlier date. Marcion circa 144, appears to have used this gospel, but he called it the Gospel of the Lord. The introductory dedication to Theophilus, 1:1-4 states that "many have undertaken to set down an orderly account of the events that have been fulfilled among us, just as they were handed on to us by those who from the beginning were eyewitnesses and servants of the word", and that the author, "after investigating everything carefully from the very first" has decided to compose an orderly account "so that [Theophilius] may know the certainty of the things [he has] been taught". Thus the author intended to write a historical account bringing out the theological significance of the history. The author's purpose was to portray Christianity as divine, respectable, law-abiding, and international. 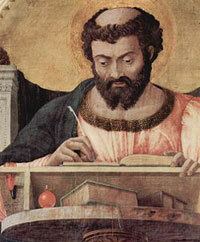 Scholarship is in wide agreement that the author of Luke also wrote the Acts of the Apostles.